The Media Foundation for West Africa (MFWA) in partnership with Citi FM will host the Auditor-General of Ghana, Mr. Daniel Yaw Domelevo, at a town hall meeting on media and corruption on Tuesday, February 12, 2019, 3:30pm, at the Coconut Grove Regency Hotel in Accra, Ghana. 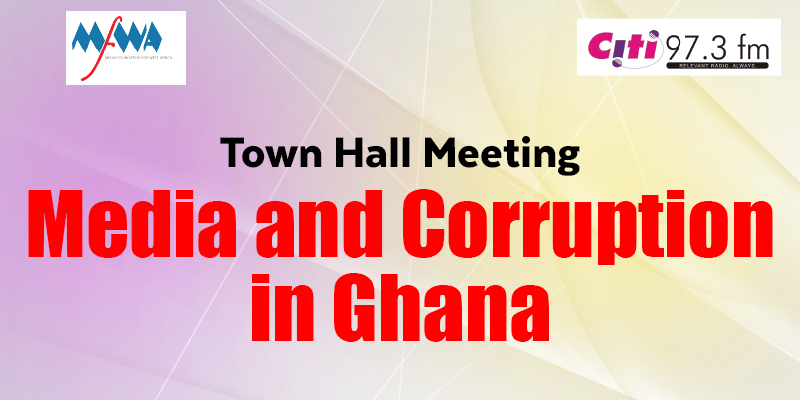 The town hall meeting will bring together media experts, journalists, civil society organisations (CSOs), government representatives and the diplomatic corps to deliberate on the media’s role in fighting corruption. 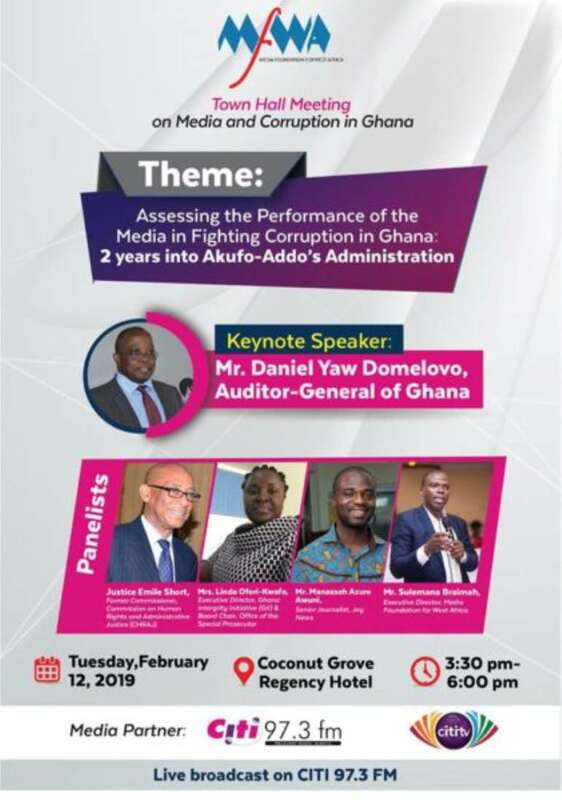 The theme for the event is Assessing the Performance of the Media in Fighting Corruption in Ghana: Two years into Akufo-Addo’s Administration. Over the years, Ghana has consistently scored low marks in the annual Corruption Perception Index, evidencing the presence of corruption in the country. As a candidate, Nana Addo Dankwa Akufo-Addo campaigned on commitments to curb public sector corruption if elected. Two years after his election as President, it is important to evaluate his Administration’s delivery on these promises. It is equally essential to assess the performance of the media with regard to its constitutional mandate to hold duty-bearers and public officials accountable. The meeting will therefore make key recommendations on how the media can effectively sustain the campaign against corruption in the country. The town hall meeting will be live on CITI 97.3 FM. The event forms part of Media Foundation for West Africa’s programme on Media and Good Governance and is organised with funding support from the William and Flora Hewlett Foundation.